We love window film on conservatory roofs because in our opinion it does the best job all round for the best price BUT! What happens when you can't use a window film? Polycarbonate roofs are essentially plastic an as such are susceptible to expansion and contraction in the sun. Unfortunately window film doesn't take very well to being stretched on a daily basis and will crack or split very quickly. 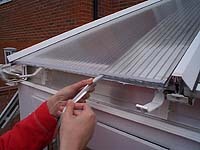 The answer lies in the way a polycarbonate roof sheet is formed. If you look at a sheet of polycarbonate you will see a honeycomb of chambers that run the entire length of each sheet. This gives the sheets their strength. We utilise these channels to feed appropriately sizes ribbons of the same film we use for window filming into the channels. The result is a fully enclosed system which will reflect up to 80% of solar heat, 70% of the glare and 99% of UV. There is no adhesive and therefore no reason why it won't last the life of your roof. The question we are asked most often when we suggest this system is "Won't it make my Conservatory dark?". The answer to this in almost all cases is "NO" because your conservatory will generally also have two or three sides which are made, principally, of glass.